After three full days of adding balsa filler blocks, gussets, trimming, sanding, and shaping, the horizontal tail was finally finished this evening. 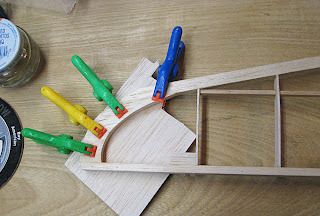 The first step was to cut out and glue some soft balsa filler blocks on top of the stab and elevator tip pieces as shown below. You can see part of the elevator in the upper right had corner of the picture. This picture is a close up of the balsa filler on the left tip of the stab. 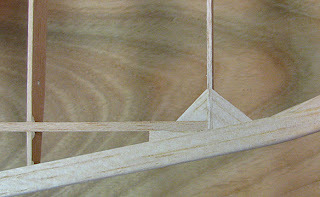 The inside edge of the filler block is trimmed and sanded to match the inside edge of the tip piece before it is glued on. 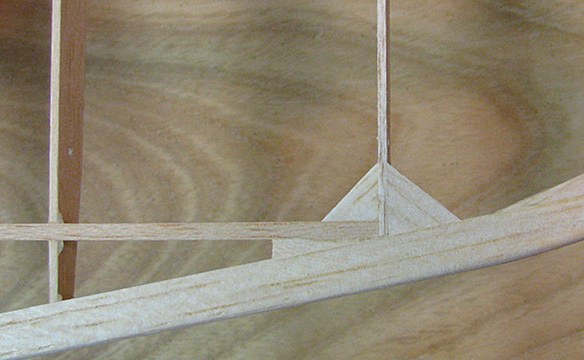 The outside edge is only roughed in because it can be easily trimmed and sanded later. 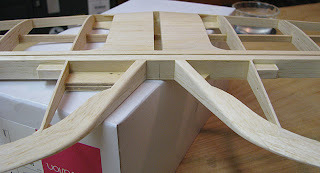 Soft balsa filler blocks were also added to the top of the elevator pieces that glue to V members as shown below. The picture of the bottom of the stab below shows the three gussets that tie the 1/8" X 1/4" spar to the leading edge. 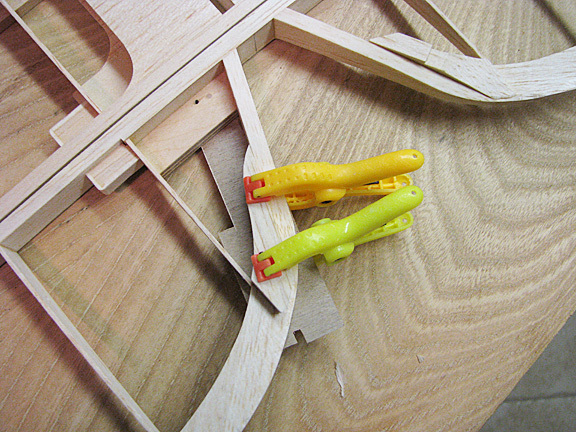 Also 1/16" gussets were added to all of the elevator's rib/TE joints to reinforce the joints. 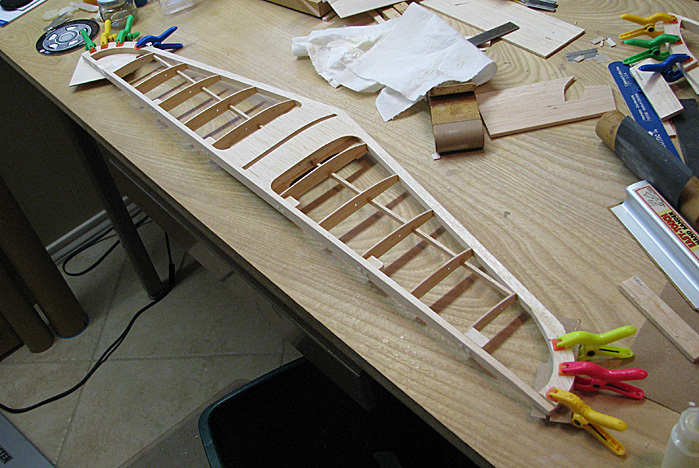 The approach used to shape the Cloudster 900's large two piece horizontal tail is kind of like cutting hair or trimming a hedge! You have to do a little bit at a time in different areas and then check the progress very carefully. You must go back over the work sometimes as many as three times. 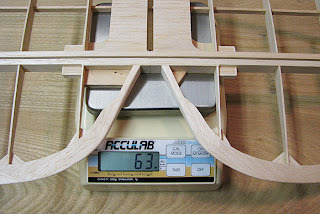 However little by little, the surface does begin to take shape. 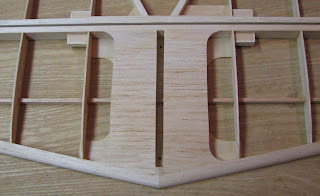 The picture below shows the right ends of the matched stab and elevator that form the right tip of the horizontal tail. 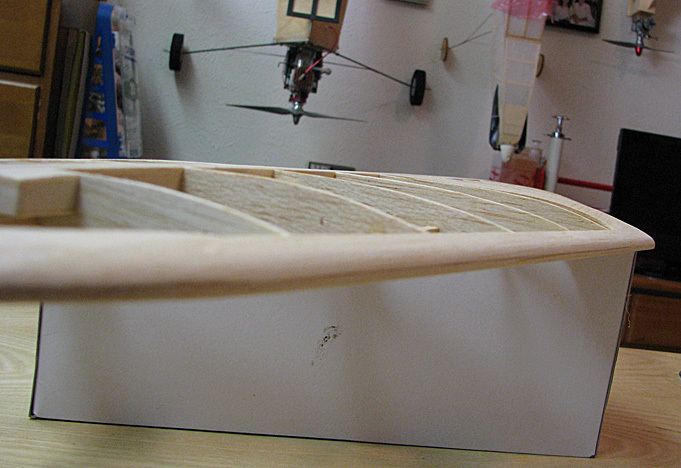 This is an edge view close up of the horizontal tail's tip. 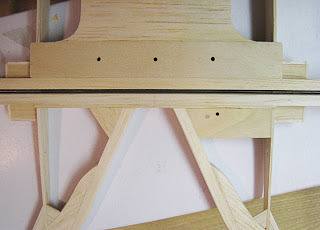 It takes a lot care to get the two hinge line spars to match. This is a rear view of the right tip that show nicely the balsa filler blocks fill out the tip, which will make the tip easy to cover. Notice the elevator's trailing edge gussets. This is a view of the finished shaped 3/8" square leading edge. 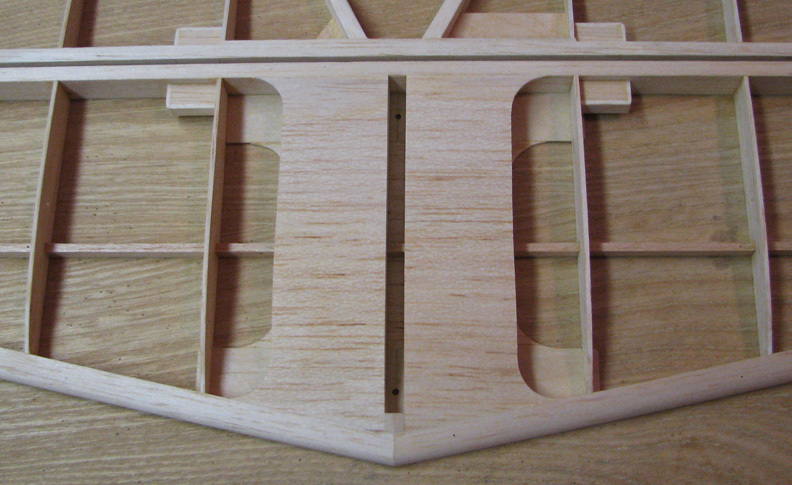 This view shows the how the elevator's trailing edges fairs into the V members. 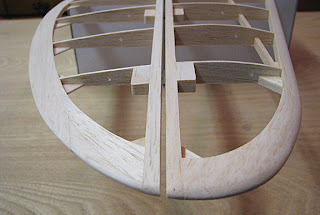 This is a view of the bottom of the V members. Notice the elevator's 3/16" gusset between the V member on the left and leading edge. 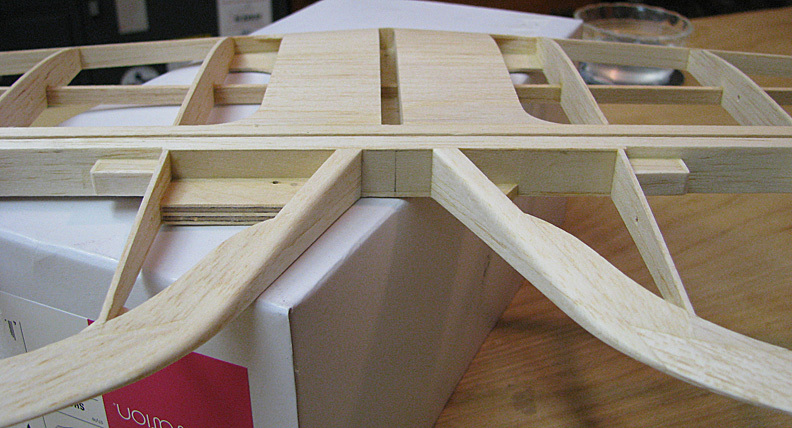 This is a top view showing the stab's center section. Notice the small plug glued in the front of the elevator slot. 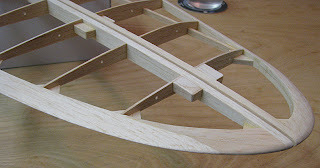 The fin leading edge will be trimmed off to fit up against this plug and then the fin leading edge fairing can be made. This picture of the finished horizontal tail says it all! 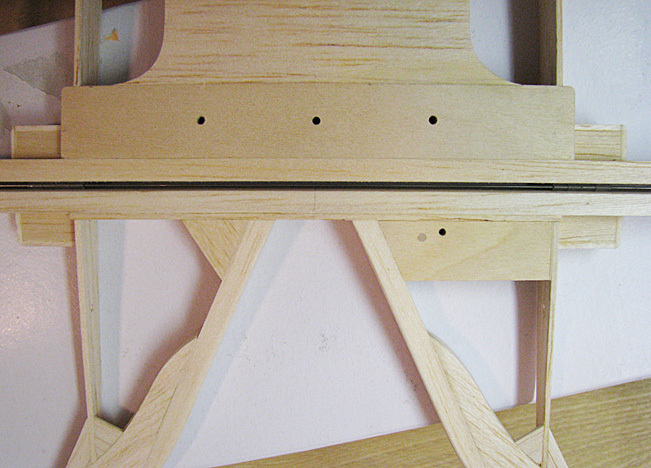 Notice the four tip gussets that tie the tip pieces to the hinge line spars of the stab and the elevator. 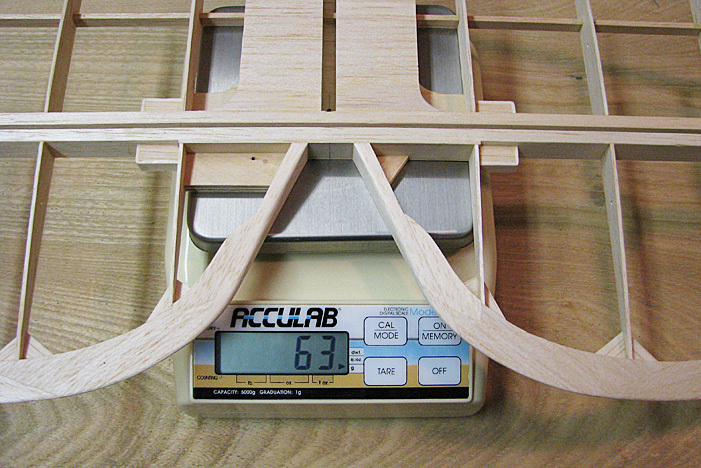 A single piece of .032" piano wire 36" long is use to pin the hinges together.